The newspaper headline that got a whole country thinking. In America on Sunday morning, thousands did as they always do and unfurled their copy of The Boston Globe. These were the headlines. Well, at least what The Globe fears they might be if Donald Trump becomes President. 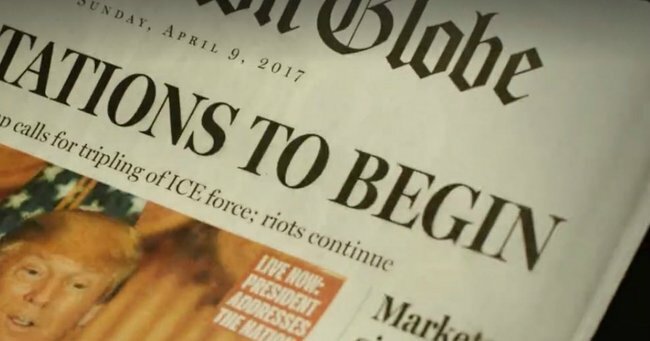 The newspaper, one of the United States&apos; most read, used a fake front page on its Sunday Ideas section to offer its readers a glimpse at what life might be like in April 2017, roughly six months after this year&apos;s election. But it&apos;s not entirely fictional. Many of the quotes used in the phony stories came directly from Trump&apos;s lips, including his pledge to deport illegal workers "so fast your head will spin". And also his assertion that "70 to 75 per cent of reporters are absolutely dishonest. Absolute scum. Remember that. Scum." But why would a newspaper, a medium in the business of reporting facts, decide to have a crack at fiction? An op-ed continued, “It is an exercise in taking a man at his word... And his vision of America promises to be as appalling in real life as it is in black and white on the page." Trump slammed The Globe&apos;s satirical front page as "stupid" and "worthless" while speaking at a campaign rally in New York. "The whole front page is a make-believe story, which is really no different from the whole paper," he said. The billionaire property mogul is currently the front-runner to gain the Republican Party nomination, and has been leading the national polls for most of the race.